Witch hazel was widely used by Native Americans, and is currently endorsed by both the FDA and herbalists. This small shrub originated in eastern North America - specifically Canada and the Northeast coast of the U.S. - and today, it is commonly cultivated in Europe and in temperate climates around the world. Witch hazel has a long history of use as a medicine by Native Americans. The bark, leaves, and twigs have all been used in traditional medicines. Witch hazel is still commonly used in many skin products and hemorrhoids medicines. Witch hazel has received FDA approval, a rarity among herbal treatments. It is also used in beauty products. Helping damaged skin. Witch hazel contains tannins that may help reduce swelling, help fight bacteria, and repair broken skin. This is what is responsible for the majority of witch hazel's medicinal benefits. Reducing the symptoms of hemorrhoids. Applying witch hazel to the skin may help relieve the itching, burning, discomfort, and irritation caused by hemorrhoids. Reducing minor bleeding. Applying witch hazel to the skin may reduce minor bleeding. The tannins and flavonoids in witch hazel are responsible for the plant's skin healing properties, with studies demonstrating the soothing effect these compounds have on the skin. Furthermore, proanthocyanidins seem to work by inhibiting inflammatory mediators and the formation of platelet-activation, which is one of the main causes of inflammation. The flavonoids are particularly recognized for their antioxidant activity, contributing to the healing benefits of the plant. Witch hazel contains tannins that may help reduce swelling, help fight bacteria, and repair broken skin. Anti-inflammatory and emollient properties can be found in jojoba, aloe, and rose, whereas agrimony and mallow also offer astringent benefits. There are no reported side effects for witch hazel consumption, and the herb is considered generally safe. However, sensitive people might experience allergic reactions after using witch hazel topically. As with any other herb, it is recommended to seek your doctor's advice before using witch hazel in any form. Witch hazel is not meant to be consumed as food, and the herb is mostly used topically in order to extract its medicinal properties. Poultice. Witch hazel leaves can be crushed and wrapped in a gauze in order to be applied topically for treating skin problems, like rashes, boils, and local inflammation. A medicinal infusion can be made with the leaves, but it is not generally recommended to ingest the plant. Liquid extract. Often combined with emollient herbs, witch hazel distillated extracts are used for soothing skin conditions, such as acne and oily skin. Salve. This is a typically home made preparation that is not meant to be absorbed, but to provide a protective layer over the area of the skin affected by boils, rashes, superficial wounds, and other dermatological complains. Cream. Witch hazel is a common ingredient in many cosmetic creams that are easily absorbed by the skin, since it provides astringent and antiseptic properties. The most common form in which witch hazel is sold is either as a tincture or distillation of the twigs, bark, or leaves. It is rare to find witch hazel in its original form. In North America, witch hazel is a native species that can be found growing naturally from Nova Scotia to Florida, and from the Great Lakes to eastern Texas. Its fragrant, bright yellow flowers are the only sign of color in woods where all the autumn leaves lay upon the forest floor. Witch hazel is a hardy species; however, some basic care in necessary for it to thrive in a home garden. 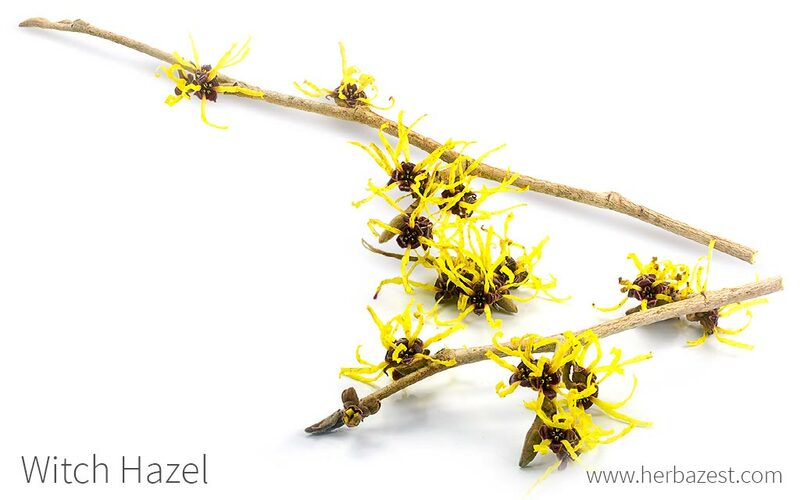 Witch hazel grows best in acidic (pH value of 6 or less), rich, and moist soils and requires regular watering. It does not cope well with too much sun, as it is a woodland plant that naturally occurs in dark forests. Common witch hazel is much easily grown from seeds than cuttings, and should be planted in pots. They should not be transplanted until they are two or three years old. Flowering will not occur until the plant is at least six years old. Witch hazels are quite hardy and can withstand extremely cold temperatures, but are also relatively sensitive to mildew and fungal leaf infestations. Witch hazel is a slow-growing deciduous shrub that can reach up to 16 feet (5 m) by 16 feet. It can grow as a small tree, but this is rarer. In winter, this perennial plant produces fragrant and distinctive-looking flowers - which can range from yellow to orange to red, and can even be purple - followed by brown fruit capsules. When ripe, these capsules eject the seeds up to 12 feet (4 m) away. The leaves have large, wavy teeth on the margins, and the upper surface is dark green in color, whereas the lower is of a paler hue. Witch hazel (Hamamelis virginiana), is a member of the small Hamamelidaceae family, which contains 23 species of shrubs and trees. Botanists have identified two naturally-occurring varieties of witch hazel. The first one, also known as "common" or "standard" witch hazel, is Hamamelis virginiana var. virginiana, which can be found from Nova Scotia to Virginia. The "prairie variety" of witch hazel (H. virginiana var. parvifolia), on the other hand, is found mainly in Ohio. There is also a cultivar, 'Rubescens', developed for landscaping and favored for its reddish flowers. In addition to these varieties, many hybrid species have also been developed, in particular by mixing Hamamelis virginiana with its close relatives, the Japanese and Chinese witch hazels (H. japonica and H. mollis). Historically and presently witch hazel is widely used for its medicinal benefits. It is also widely used in the beauty industry, popping up in lotions, creams, and skin washes. Witch hazel is often found as an ingredient in toners and cleansers. The most common witch hazel product available in the U.S. is made from the whole twigs of the shrub. Extracts of the bark alone are used in Europe. Witch hazel saplings are also sold for living fences and parking strips, as the plant's low water requirements make it a practical option for urban settings. With hazel was used by the Native Americans to find underground water sources. European settlers observed that natives would know there was water beneath the ground when the dowsing end of the stick would bend, and so this practice was exported to Europe. Until the 20th century, dowsing was an essential part of the well-digging process. The cosmetic industry benefits the most from witch hazel. Owing to its natural astringent, anti-inflammatory properties, the herb is used as an ingredient in commercial products for treating acne, reducing puffy eyes, and soothing sunburn.